For other uses, see Norse. Not to be confused with Old Nordic or Old North. Old Norse was a North Germanic language that was spoken by inhabitants of Scandinavia and their overseas settlements from about the 9th to the 13th century. The Proto-Norse language developed into Old Norse by the 8th century, and Old Norse began to develop into the modern North Germanic languages in the mid- to late 14th century, ending the language phase known as Old Norse. These dates, however, are not absolute, since written Old Norse is found well into the 15th century. Old Norse was divided into three dialects: Old West Norse, Old East Norse, and Old Gutnish. Old West and East Norse formed a dialect continuum, with no clear geographical boundary between them. For example, Old East Norse traits were found in eastern Norway, although Old Norwegian is classified as Old West Norse, and Old West Norse traits were found in western Sweden. Most speakers spoke Old East Norse in what is present day Denmark and Sweden. Old Gutnish, the more obscure dialectal branch, is sometimes included in the Old East Norse dialect due to geographical associations. It developed its own unique features and shared in changes to both other branches. The 12th-century Icelandic Gray Goose Laws state that Swedes, Norwegians, Icelanders, and Danes spoke the same language, dǫnsk tunga ("Danish tongue"; speakers of Old East Norse would have said dansk tunga). Another term, used especially commonly with reference to West Norse, was norrœnt mál or norrǿnt mál ("Nordic/Northern speech"). Today Old Norse has developed into the modern North Germanic languages Icelandic, Faroese, Norwegian, Danish, and Swedish, of which Norwegian, Danish and Swedish retain considerable mutual intelligibility. Old Icelandic was very close to Old Norwegian, and together they formed the Old West Norse dialect, which was also spoken in settlements in Ireland, Scotland, the Isle of Man and northwest England, and in Norse settlements in Normandy. The Old East Norse dialect was spoken in Denmark, Sweden, settlements in Kievan Rus', eastern England, and Danish settlements in Normandy. The Old Gutnish dialect was spoken in Gotland and in various settlements in the East. In the 11th century, Old Norse was the most widely spoken European language, ranging from Vinland in the West to the Volga River in the East. In Kievan Rus', it survived the longest in Veliky Novgorod, probably lasting into the 13th century there. The age of the Swedish-speaking population of Finland is strongly contested, but at latest by the time of the Second Swedish Crusade in the 13th century, Swedish settlement had spread the language into the region. The modern descendants of the Old West Norse dialect are the West Scandinavian languages of Icelandic, Faroese, Norwegian and the extinct Norn language of Orkney and Shetland; the descendants of the Old East Norse dialect are the East Scandinavian languages of Danish and Swedish. Norwegian is descended from Old West Norse, but over the centuries it has been heavily influenced by East Norse, particularly during the Denmark–Norway union. Among these, Icelandic and the closely related Faroese have changed the least from Old Norse in the last thousand years, although with Danish rule of the Faroe Islands, Faroese has also been influenced by Danish. Old Norse also had an influence on English dialects and Lowland Scots, which contain many Old Norse loanwords. It also influenced the development of the Norman language, and through it and to a smaller extent, that of modern French. Of the modern languages, Icelandic is the closest to Old Norse. Written modern Icelandic derives from the Old Norse phonemic writing system. Contemporary Icelandic-speakers can read Old Norse, which varies slightly in spelling as well as semantics and word order. However, pronunciation, particularly of the vowel phonemes, has changed at least as much as in the other North Germanic languages. Faroese retains many similarities but is influenced by Danish, Norwegian, and Gaelic (Scottish and/or Irish). Although Swedish, Danish and the Norwegian languages have diverged the most, they still retain mutual intelligibility. Speakers of modern Swedish, Norwegian and Danish can mostly understand each other without studying their neighboring languages, particularly if speaking slowly. The languages are also sufficiently similar in writing that they can mostly be understood across borders. This could be because these languages have been mutually affected by each other, as well as having a similar development influenced by Middle Low German. Various other languages, which are not closely related, have been heavily influenced by Norse, particularly the Norman language. Russian, Ukrainian, Belarusian, Lithuanian, Finnish, Latvian and Estonian also have a number of Norse loanwords; the words Rus and Russia, according to one theory, may be named after the Rus' people, a Norse tribe; see Rus (name), probably from present-day east-central Sweden. The current Finnish and Estonian words for Sweden are Ruotsi and Rootsi, respectively. A number of loanwords have been introduced into the Irish language – many but not all are associated with fishing and sailing. A similar influence is found in Scots Gaelic, with over one hundred loanwords estimated to be in the language, many of which, but not all, are related to fishing and sailing. The vowel phonemes mostly come in pairs of long and short. The standardized orthography marks the long vowels with an acute accent. In medieval manuscripts, it is often unmarked but sometimes marked with an accent or through gemination. Old Norse has had nasalized versions of all ten vowel places. [cv 1] These occurred as allophones of the vowels before nasal consonants and in places where a nasal had followed it in an older form of the word, before it was absorbed into a neighboring sound. If the nasal was absorbed by a stressed vowel, it would also lengthen the vowel. These nasalizations also occurred in the other Germanic languages, but were not retained long. They were noted in the First Grammatical Treatise, and otherwise might have remained unknown. The First Grammarian marked these with a dot above the letter. [cv 1] This notation did not catch on, and would soon be obsolete. Nasal and oral vowels probably merged around the 11th century in most of Old East Norse. However, the distinction still holds in Dalecarlian dialects. The dots in the following vowel table separate the oral from nasal phonemes. Sometime around the 13th century, /ɔ/ (spelled ǫ) merged with /ø/ or /o/ in all dialects except Old Danish. In Icelandic, all /ɔ/ (ǫ) merged with /ø/. This can be determined by their distinction within the 12th-century First Grammatical Treatise but not within the early 13th-century Prose Edda. The nasal vowels, also noted in the First Grammatical Treatise, are assumed to have been lost in most dialects by this time (but notably they are retained in Elfdalian). See Old Icelandic for the mergers of /øː/ (spelled œ) with /ɛː/ (spelled æ) and /ɛ/ (spelled ę) with /e/ (e). Old Norse had three diphthong phonemes: /ɛi/, /ɔu/, /øy ~ ɛy/ (spelled ei, au, ey respectively). In East Norse these would monophthongize and merge with /eː/ and /øː/; whereas in West Norse and its descendants the diphthongs remained. Ṽ Ṽ Ṽ Ṽ V komȧ < *kwemaną "to come, arrive"; OWN vėtr/vėttr < vintr < *wintruz "winter"
Old Norse has six plosive phonemes, /p/ being rare word-initially and /d/ and /b/ pronounced as voiced fricative allophones between vowels except in compound words (e.g. veðrabati), already in the Proto-Germanic language (e.g. *b *[β] > [v] between vowels). The /ɡ/ phoneme was pronounced as [ɡ] after an n or another g and as [k] before /s/ and /t/. Some accounts have it a voiced velar fricative [ɣ] in all cases, and others have that realisation only in the middle of words and between vowels (with it otherwise being realised [ɡ]). [clarification needed] The Old East Norse /ʀ/ was an apical consonant, with its precise position is unknown; it is reconstructed as a palatal sibilant. It descended from Proto-Germanic /z/ and eventually developed into /r/, as had already occurred in Old West Norse. The consonant digraphs hl, hr, hn occurred word-initially. It is unclear whether they were sequences of two consonants (with the first element realised as /h/ or perhaps /x/) or as single voiceless sonorants /l̥/, /r̥/ and /n̥/ respectively. In Old Norwegian, Old Danish and later Old Swedish, the groups hl, hr, hn were reduced to plain l, r, n, which suggests that they had most likely already been pronounced as voiceless sonorants by Old Norse times. The pronunciation of hv is unclear, but it may have been /xʷ/ (the Proto-Germanic pronunciation), /hʷ/ or /ʍ/. Unlike the three other digraphs, it was retained much longer in all dialects. Without ever developing into a voiceless sonorant in Icelandic, it instead underwent fortition to a plosive /kv/, which suggests that instead of being a voiceless sonorant, it retained a stronger frication. Unlike Proto-Norse, which was written with the Elder Futhark, runic Old Norse was originally written with the Younger Futhark, which only had 16 letters. Because of the limited number of runes, several runes were used for different sounds, and the distinction between long and short vowels wasn't retained in writing. Medieval runes came into use some time later. As for the Latin alphabet, there was no standardized orthography in use in the Middle Ages. A modified version of the letter wynn called vend was used briefly for the sounds /u/, /v/, and /w/. Long vowels were sometimes marked with acutes, but also sometimes left unmarked or geminated. The standardized Old Norse spelling was created in the 19th century, and is for the most part phonemic. The most notable deviation is that the non-phonemic difference between the voiced and the voiceless dental fricative is marked—the oldest texts as well as runic inscriptions use þ exclusively. Long vowels are denoted with acutes. Most other letters are written with the same glyph as the IPA phoneme, except as shown in the table below. Primary stress in Old Norse falls on the word stem, so that hyrjar would be pronounced /ˈhyr.jar/. In compound words, secondary stress falls on the second stem (e.g. lærisveinn, /ˈlɛːɾ.iˌswɛinː/). Ablaut patterns are groups of vowels which are swapped, or ablauted, in the nucleus of a word. Strong verbs ablaut the lemma's nucleus to derive the past forms of the verb. This parallels English conjugation, where, e.g., the nucleus of sing becomes sang in the past tense and sung in the past participle. Some verbs are derived by ablaut, as the present-in-past verbs do by consequence of being derived from the past tense forms of strong verbs. Umlaut or mutation is an assimilatory process acting on vowels preceding a vowel or semivowel of a different vowel backness. In the case of i-umlaut and ʀ-umlaut, this entails a fronting of back vowels, with retention of lip rounding. In the case of u-umlaut, this entails labialization of unrounded vowels. Umlaut is phonemic and in many situations grammatically significant as a side effect of losing the Proto-Germanic morphological suffixes whose vowels created the umlaut allophones. Some /y/, /yː/, /ø/, /øː/, /ɛ/, /ɛː/, /øy/, and all /ɛi/ were obtained by i-umlaut from /u/, /uː/, /o/, /oː/, /a/, /aː/, /au/, and /ai/ respectively. Others were formed via ʀ-umlaut from /u/, /uː/, /a/, /aː/, and /au/. Some /y/, /yː/, /ø/, /øː/, and all /ɔ/, /ɔː/ were obtained by u-umlaut from /i/, /iː/, /e/, /eː/, and /a/, /aː/ respectively. See Old Icelandic for information on /ɔː/. OEN often preserves the original value of the vowel directly preceding runic ʀ while OWN receives ʀ-umlaut. Compare runic OEN glaʀ, haʀi, hrauʀ with OWN gler, heri (later héri), hrøyrr/hreyrr ("glass", "hare", "pile of rocks"). U-umlaut is more common in Old West Norse in both phonemic and allophonic positions, while it only occurs sparsely in post-runic Old East Norse and even in runic Old East Norse. Compare West Old Norse fǫður (accusative of faðir, 'father'), vǫrðr (guardian/caretaker), ǫrn (eagle), jǫrð ('earth', Modern Icelandic: jörð), mjǫlk ('milk', Modern Icelandic: mjólk) with Old Swedish faður, varðer, ørn, jorð, miolk and Modern Swedish fader, vård, örn, jord, mjölk with the latter two demonstrating the u-umlaut found in Swedish. This is still a major difference between Swedish and Faroese and Icelandic today. Plurals of neuters do not have u-umlaut at all in Swedish, but in Faroese and Icelandic they do, for example the Faroese and Icelandic plurals of the word land, lond and lönd respectively, in contrast to the Swedish plural länder and numerous other examples. That also applies to almost all feminine nouns, for example the largest feminine noun group, the o-stem nouns (except the Swedish noun jord mentioned above), and even i-stem nouns and root nouns, such as Old West Norse mǫrk (mörk in Icelandic) in comparison with Modern and Old Swedish mark. Vowel breaking, or fracture, caused a front vowel to be split into a semivowel-vowel sequence before a back vowel in the following syllable. While West Norse only broke e, East Norse also broke i. The change was blocked by a v, l, or r preceding the potentially-broken vowel. When a noun, pronoun, adjective, or verb has a long vowel or diphthong in the accented syllable and its stem ends in a single l, n, or s, the r (or the elder r- or z-variant ʀ) in an ending is assimilated. [cv 4] When the accented vowel is short, the ending is dropped. The nominative of the strong masculine declension and some i-stem feminine nouns uses one such -r (ʀ). Óðin-r (Óðin-ʀ) becomes Óðinn instead of *Óðinr (*Óðinʀ). The verb blása 'to blow', has third person present tense blæss for "[he] blows" rather than *blæsr (*blæsʀ). Similarly, the verb skína 'to shine' had present tense third person skínn (rather than *skínr, *skínʀ); while kala 'to cool down' had present tense third person kell (rather than *kelr, *kelʀ). The rule is not absolute, with certain counter-examples such as vinr, which has the synonym vin, yet retains the unabsorbed version, and jǫtunn, where assimilation takes place even though the root vowel, ǫ, is short. The clusters */Clʀ, Csʀ, Cnʀ, Crʀ/ cannot yield */Clː, Csː, Cnː, Crː/ respectively, instead /Cl, Cs, Cn, Cr/. The effect of this shortening can result in the lack of distinction between some forms of the noun. In the case of vetr, the nominative and accusative singular and plural forms are identical. The nominative singular and nominative and accusative plural would otherwise have been OWN *vetrr, OEN *vintrʀ. These forms are impossible because the cluster */Crʀ/ cannot be realized as /Crː/, nor as */Crʀ/, nor as */Cʀː/. The same shortening as in vetr also occurs in lax = laks (as opposed to *lakss, *laksʀ), botn (as opposed to *botnn, *botnʀ), and jarl (as opposed to *jarll, *jarlʀ). I/j adjacent to i, e, their u-umlauts, and æ was not possible, nor u/v adjacent to u, o, their i-umlauts, and ǫ. At the beginning of words, this manifested as a dropping of the initial j or v. Compare ON orð, úlfr, ár with English word, wolf, year. In inflections, this manifested as the dropping of the inflectional vowels. Thus, klæði + dat -i remains klæði, and sjáum in Icelandic progressed to sjǫ́um > sjǫ́m > sjám. The jj and ww of Proto-Germanic became ggj and ggv respectively in Old Norse, a change known as Holtzmann's law. An epenthetic vowel became popular by 1200 in Old Danish, 1250 in Old Swedish and Norwegian, and 1300 in Old Icelandic. An unstressed vowel was used which varied by dialect. Old Norwegian exhibited all three: /u/ was used in West Norwegian south of Bergen, as in aftur, aftor (older aptr); North of Bergen, /i/ appeared in aftir, after; and East Norwegian used /a/, after, aftær. Old Norse was a moderately inflected language with high levels of nominal and verbal inflection. Most of the fused morphemes are retained in modern Icelandic, especially in regard to noun case declensions, whereas modern Norwegian in comparison has moved towards more analytical word structures. Old Norse had three grammatical genders – masculine, feminine and neuter. Adjectives or pronouns referring to a noun must mirror the gender of that noun, so that one says, "heill maðr!" but, "heilt barn!" As in other languages, the grammatical gender of an impersonal noun is generally unrelated to an expected natural gender of that noun. While indeed karl, "man" is masculine, kona, "woman", is feminine, and hús, house, is neuter, so also are hrafn and kráka, for "raven" and "crow", masculine and feminine respectively, even in reference to a female raven or a male crow. All neuter words have identical nominative and accusative forms, and all feminine words have identical nominative and accusative plurals. The gender of some words' plurals does not agree with that of their singulars, such as lim and mund. [cv 5] Some words, such as hungr, have multiple genders, evidenced by their determiners being declined in different genders within a given sentence. Nouns, adjectives and pronouns were declined in four grammatical cases—nominative, accusative, genitive and dative—in singular and plural numbers. Adjectives and pronouns were additionally declined in three grammatical genders. Some pronouns (first and second person) could have dual number in addition to singular and plural. The genitive was used partitively and in compounds and kennings (e.g., Urðarbrunnr, the well of Urðr; Lokasenna, the gibing of Loki). The numerous "weak" noun paradigms had a much higher degree of syncretism between the different cases; i.e., they had fewer forms than the "strong" nouns. A definite article was realised as a suffix that retained an independent declension; e.g., troll (a troll) – trollit (the troll), hǫll (a hall) – hǫllin (the hall), armr (an arm) – armrinn (the arm). This definite article, however, was a separate word and did not become attached to the noun before later stages of the Old Norse period. Wikimedia Commons has media related to Old Norse manuscripts. The earliest inscriptions in Old Norse are runic, from the 8th century. Runes continued to be commonly used until the 15th century and have been recorded to be in use in some form as late as the 19th century in some parts of Sweden. With the conversion to Christianity in the 11th century came the Latin alphabet. The oldest preserved texts in Old Norse in the Latin alphabet date from the middle of the 12th century. Subsequently, Old Norse became the vehicle of a large and varied body of vernacular literature, unique in medieval Europe. Most of the surviving literature was written in Iceland. Best known are the Norse sagas, the Icelanders' sagas and the mythological literature, but there also survives a large body of religious literature, translations into Old Norse of courtly romances, classical mythology, and the Old Testament, as well as instructional material, grammatical treatises and a large body of letters and official documents. Móðir Dyggva var Drótt, dóttir Danps konungs, sonar Rígs er fyrstr var konungr kallaðr á danska tungu. Dyggvi's mother was Drott, the daughter of king Danp, Ríg's son, who was the first to be called king in the Danish tongue. ...stirt var honum norrœnt mál, ok kylfdi mᴊǫk til orðanna, ok hǫfðu margir menn þat mᴊǫk at spotti. ...the Norse language was hard for him, and he often fumbled for words, which amused people greatly. However, some changes were geographically limited and so created a dialectal difference between Old West Norse and Old East Norse. As Proto-Norse evolved into Old Norse, in the 8th century, the effects of the umlauts seem to have been very much the same over the whole Old Norse area. But in later dialects of the language a split occurred mainly between west and east as the use of umlauts began to vary. The typical umlauts (for example fylla from *fullijan) were better preserved in the West due to later generalizations in the east where many instances of umlaut were removed (many archaic Eastern texts as well as eastern runic inscriptions however portray the same extent of umlauts as in later Western Old Norse). All the while, the changes resulting in breaking (for example hiarta from *hertō) were more influential in the East probably once again due to generalizations within the inflectional system. This difference was one of the greatest reasons behind the dialectalization that took place in the 9th and 10th centuries, shaping an Old West Norse dialect in Norway and the Atlantic settlements and an Old East Norse dialect in Denmark and Sweden. Old West Norse and Old Gutnish did not take part in the monophthongization which changed æi (ei) into ē, øy (ey) and au into ø̄, nor did certain peripheral dialects of Swedish, as seen in modern Ostrobothnian dialects. Another difference was that Old West Norse lost certain combinations of consonants. The combinations -mp-, -nt-, and -nk- were assimilated into -pp-, -tt- and -kk- in Old West Norse, but this phenomenon was limited in Old East Norse. Some past participles and other words underwent i-umlaut in Old West Norse but not in Old East Norse dialects. Examples of that are Icelandic slegið/sleginn and tekið/tekinn, which in Swedish are slagit/slagen and tagit/tagen. This can also be seen in the Icelandic and Norwegian words sterkur and sterk ("strong"), which in Swedish is stark as in Old Swedish. These differences can also be seen in comparison between Norwegian and Swedish. An early difference between Old West Norse and the other dialects was that Old West Norse had the forms bú "dwelling", kú "cow" (accusative) and trú "faith" whereas Old East Norse had bó, kó and tró. Old West Norse was also characterized by the preservation of u-umlaut, which meant that for example Proto-Norse *tanþu "tooth" was pronounced tǫnn and not tann as in post-runic Old East Norse; OWN gǫ́s and runic OEN gǫ́s, while post-runic OEN gás "goose". The earliest body of text appears in runic inscriptions and in poems composed c. 900 by Þjóðólfr of Hvinir (although the poems are not preserved in contemporary sources, but only in much later manuscripts). The earliest manuscripts are from the period 1150–1200 and concern both legal, religious and historical matters. During the 12th and 13th centuries, Trøndelag and Western Norway were the most important areas of the Norwegian kingdom and they shaped Old West Norse as an archaic language with a rich set of declensions. In the body of text that has come down to us from until c. 1300, Old West Norse had little dialect variation, and Old Icelandic does not diverge much more than the Old Norwegian dialects do from each other. Old Norwegian differentiated early from Old Icelandic by the loss of the consonant h in initial position before l, n and r, thus whereas Old Icelandic manuscripts might use the form hnefi "fist", Old Norwegian manuscripts might use nefi. From the late 13th century, Old Icelandic and Old Norwegian started to diverge more. After c. 1350, the Black Death and following social upheavals seem to have accelerated language changes in Norway. From the late 14th century, the language used in Norway is generally referred to as Middle Norwegian. Old West Norse underwent a lengthening of initial vowels at some point, especially in Norwegian, so that OWN eta became éta, ONW akr > ákr, OIC ek > ék. In Iceland, initial /w/ before /ɾ/ was lost. [cv 6] Compare Icelandic rangur with Norwegian vrangr, OEN vrangʀ. This change is shared with Old Gutnish. /w/ merged with /v/ during the 12th century. This caused /v/ to become an independent phoneme from /f/, and the written distinction of ⟨v⟩ for /v/ from medial and final ⟨f⟩ to become merely etymological. Around the 11th century, Old Norwegian ⟨hl⟩, ⟨hn⟩, and ⟨hr⟩ became ⟨l⟩, ⟨n⟩, and ⟨r⟩. It is debatable whether the ⟨hC⟩ sequences represented a consonant cluster, /hC/, or a devoicing, /C̥/. Orthographic evidence suggests that, in a confined dialect of Old Norwegian, /ɔ/ may have been unrounded before /u/, so that u-umlaut was reversed where the u had not been eliminated. e.g. ǫll, ǫllum > ǫll, allum. This dialect of Old West Norse was spoken by Icelandic colonies in Greenland. When the colonies died out around the 15th century, the dialect went with it. The phoneme /θ/, and some /ð/ merged to /t/, so that Old Icelandic Þórðr becomes Tortr. The following text is from Alexanders saga, an Alexander romance. The manuscript, AM 519 a 4to, is dated c. 1280. The facsimile demonstrates the sigla used by scribes to write Old Norse. Many of these were borrowed from Latin. Without familiarity with these abbreviations, the facsimile will be unreadable to many. In addition, reading the manuscript itself requires familiarity with the letterforms of the native script. The abbreviations are expanded in a version with normalized spelling like the standard normalization system's. Comparing this to the spelling of the same text in Modern Icelandic shows that, while pronunciation has changed greatly, spelling has changed little. [...] ſem oꝩın͛ h̅ſ brıgzloðo h̅o̅ epꞇ͛ þͥ ſe̅ ſıðaʀ mon ſagꞇ verða. Þeſſı ſveın̅ aͬ. * ꝩar ıſcola ſeꞇꞇr ſem ſıðꝩenıa e͛ ꞇıl rıkra man̅a vꞇan-lanꝺz aꞇ laꞇa g͛a vıð boꝛn̅ ſíıƞ́ Meıſꞇarı ꝩar h̅o̅ ꝼengın̅ ſa e͛ arıſꞇoꞇıleſ heꞇ. h̅ ꝩar harðla goðꝛ clercr ⁊ en̅ meſꞇı ſpekıngr aꞇ ꝩıꞇı. ⁊ er h̅ ꝩͬ .xíí. veꞇᷓ gamall aꞇ allꝺrı nalıga alroſcın̅ aꞇ ꝩıꞇı. en ſꞇoꝛhvgaðꝛ u̅ ꝼᷓm alla ſına ıaꝼnallꝺꝛa. * a printed in uncial. Uncials not encoded separately in Unicode as of this section's writing. 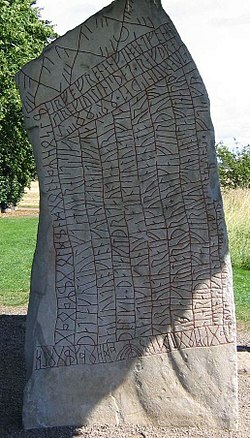 The Rök Runestone in Östergötland, Sweden, is the longest surviving source of early Old East Norse. It is inscribed on both sides. Old East Norse, between 800 and 1100, is called Runic Swedish in Sweden and Runic Danish in Denmark, but for geographical not linguistic reasons. Any differences between the two were minute at best during the more ancient stages of this dialect group. Changes had a tendency to occur earlier in the Danish region. Even today many Old Danish changes have still not taken place in modern Swedish. Swedish is therefore the more archaic of the two in both the ancient and the modern languages, sometimes by a profound margin but in general, differences are still minute. The language is called runic because the body of text appears in runes. Runic Old East Norse is characteristically archaic in form, especially Swedish (which is still true for modern Swedish compared to Danish). In essence it matches or surpasses the archaicness of post-runic Old West Norse which in its turn is generally more archaic than post-runic Old East Norse. While typically "Eastern" in structure, many later post-runic changes and trademarks of OEN had yet to happen. The phoneme ʀ, which evolved during the Proto-Norse period from z, was still clearly separated from r in most positions, even when being geminated, while in OWN it had already merged with r.
Monophthongization of æi > ē and øy, au > ø̄ started in mid-10th-century Denmark. Compare runic OEN: fæigʀ, gæiʀʀ, haugʀ, møydōmʀ, diūʀ; with Post-runic OEN: fēgher, gēr, hø̄gher, mø̄dōmber, diūr; OWN: feigr, geirr, haugr, meydómr, dýr; from PN *faigiaz, *gaizaz, *haugaz, *mawi- + dōmaz (maidendom; virginity), *diuza ((wild) animal). Feminine o-stems often preserve the plural ending -aʀ while in OWN they more often merge with the feminine i-stems: (runic OEN) *sōlaʀ, *hafnaʀ/*hamnaʀ, *vāgaʀ while OWN sólir, hafnir and vágir (modern Swedish solar, hamnar, vågar; suns, havens, scales; Danish has mainly lost the distinction between the two stems with both endings now being rendered as -er or -e alternatively for the o-stems). Vice versa, masculine i-stems with the root ending in either g or k tended to shift the plural ending to that of the ja-stems while OEN kept the original: drængiaʀ, *ælgiaʀ and *bænkiaʀ while OWN drengir, elgir (elks) and bekkir (modern Danish drenge, elge, bænke, modern Swedish drängar, älgar, bänkar). The plural ending of ja-stems were mostly preserved while those of OEN often acquired that of the i-stems: *bæðiaʀ, *bækkiaʀ, *væfiaʀ while OWN beðir (beds), bekkir, vefir (modern Swedish bäddar, bäckar, vävar). Until the early 12th century, Old East Norse was very much a uniform dialect. It was in Denmark that the first innovations appeared that would differentiate Old Danish from Old Swedish (Bandle 2005, Old East Nordic, pp. 1856, 1859) as these innovations spread north unevenly (unlike the earlier changes that spread more evenly over the East Norse area) creating a series of isoglosses going from Zealand to Svealand. In Old Danish, /hɾ/ merged with /ɾ/ during the 9th century. From the 11th to 14th centuries, the unstressed vowels -a, -o and -e (standard normalization -a, -u and -i) started to merge into -ə, represented with the letter e. This vowel came to be epenthetic, particularly before -ʀ endings. At the same time, the voiceless stop consonants p, t and k became voiced plosives and even fricative consonants. Resulting from these innovations, Danish has kage (cake), tunger (tongues) and gæster (guests) whereas (Standard) Swedish has retained older forms, kaka, tungor and gäster (OEN kaka, tungur, gæstir). Moreover, the Danish pitch accent shared with Norwegian and Swedish changed into stød around this time. At the end of the 10th and early 11th century initial h- before l, n and r was still preserved in the middle and northern parts of Sweden, and is sporadically still preserved in some northern dialects as g-, e.g. gly (lukewarm), from hlýʀ. The Dalecarlian dialects developed independently from Old Swedish and as such can be considered separate languages from Swedish. 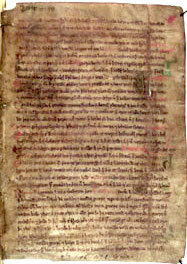 This is an extract from Västgötalagen, the Westrogothic law. It is the oldest text written as a manuscript found in Sweden and from the 13th century. It is contemporaneous with most of the Icelandic literature. The text marks the beginning of Old Swedish as a distinct dialect. Dræpær maþar svænskan man eller smalenskæn, innan konongsrikis man, eigh væstgøskan, bøte firi atta ørtogher ok þrettan markær ok ænga ætar bot. [...] Dræpar maþær danskan man allæ noræn man, bøte niv markum. Dræpær maþær vtlænskan man, eigh ma frid flyia or landi sinu oc j æth hans. Dræpær maþær vtlænskæn prest, bøte sva mykit firi sum hærlænskan man. Præstær skal i bondalaghum væræ. Varþær suþærman dræpin ællær ænskær maþær, ta skal bøta firi marchum fiurum þem sakinæ søkir, ok tvar marchar konongi. If someone slays a Swede or a Smålander, a man from the kingdom, but not a West Geat, he will pay eight örtugar and thirteen marks, but no weregild. [...] If someone slays a Dane or a Norwegian, he will pay nine marks. If someone slays a foreigner, he shall not be banished and have to flee to his clan. If someone slays a foreign priest, he will pay as much as for a fellow countryman. A priest counts as a freeman. If a Southerner is slain or an Englishman, he shall pay four marks to the plaintiff and two marks to the king. Due to Gotland's early isolation from the mainland, many features of Old Norse did not spread from or to the island, and Old Gutnish developed as an entirely separate branch from Old East and West Norse. For example, the diphthong ai in aigu, þair and waita was not retroactively umlauted to ei as in e.g. Old Icelandic eigu, þeir and veita. Gutnish also shows dropping of /w/ in initial /wɾ/, which it shares with the Old West Norse dialects (except Old East Norwegian), but which is otherwise abnormal. Breaking was also particularly active in Old Gutnish, leading to e.g. biera, unlike mainland bera. So gingu gutar sielfs wiliandi vndir suia kunung þy at þair mattin frir Oc frelsir sykia suiariki j huerium staþ. vtan tull oc allar utgiftir. So aigu oc suiar sykia gutland firir vtan cornband ellar annur forbuþ. hegnan oc hielp sculdi kunungur gutum at waita. En þair wiþr þorftin. oc kallaþin. sendimen al oc kunungr oc ierl samulaiþ a gutnal þing senda. Oc latta þar taka scatt sinn. þair sendibuþar aighu friþ lysa gutum alla steþi til sykia yfir haf sum upsala kunungi til hoyrir. Oc so þair sum þan wegin aigu hinget sykia. So, by their own will, the Gotlanders became the subjects of the Swedish king, so that they could travel freely and without risk to any location in the Swedish kingdom without toll and other fees. Likewise, the Swedes had the right to go to Gotland without corn restrictions or other prohibitions. The king was to provide protection and help, when they needed it and asked for it. The king and the jarl shall send emissaries to the Gutnish thing to receive the taxes. These emissaries shall declare free passage for the Gotlanders to all locations in the sea of the king at Uppsala and likewise for everyone who wanted to travel to Gotland. In a simple sentence like "They are both weak," the extent of the Old Norse loanwords becomes quite clear (Old East Norse with archaic pronunciation: "Þæiʀ eʀu báðiʀ wæikiʀ" while Old English "híe syndon bégen (þá) wáce"). The words "they" and "weak" are both borrowed from Old Norse, and the word "both" might also be a borrowing, though this is disputed (cf. German beide).[who?] While the number of loanwords adopted from the Norse was not as numerous as that of Norman French or Latin, their depth and everyday nature make them a substantial and very important part of everyday English speech as they are part of the very core of the modern English vocabulary. Tracing the origins of words like "bull" and "Thursday" is more difficult. "Bull" may derive from either Old English bula or Old Norse buli, while "Thursday" may be a borrowing or simply derive from the Old English Þunresdæg, which could have been influenced by the Old Norse cognate. The word "are" is from Old English earun/aron, which stems back to Proto-Germanic as well as the Old Norse cognates. ^ Bokmål norwegian – a mixture of Danish and pure Norwegian; Nynorsk norwegian – mostly based on West Norwegian dialects and without Danish influence; No = same in both forms of Norwegian. ^ a b c Vowel length in the modern Scandinavian languages does not stem from Old Norse vowel length. In all of the modern languages, Old Norse vowel length was lost, and vowel length became allophonically determined by syllable structure, with long vowels occurring when followed by zero or one consonants (and some clusters, e.g. in Icelandic, most clusters of obstruent to obstruent + [r], [j] or [v], such as [pr], [tj], [kv] etc. ); short vowels occurred when followed by most consonant clusters, including double consonants. Often, pairs of short and long vowels became differentiated in quality before the loss of vowel length and thus did not end up merging; e.g. Old Norse /a aː i iː/ became Icelandic /a au ɪ i/, all of which can occur allophonically short or long. In the mainland Scandinavian languages, double consonants were reduced to single consonants, making the new vowel length phonemic. ^ a b c d e f g h i When not followed by a consonant. ^ a b ⟨o⟩ or (before /r/) ⟨ø⟩ in some isolated words, but the tendency was to restore ⟨a⟩. ^ When un-umlauted */u/ is still present elsewhere in the paradigm. Old Norse morphology—The grammar of the language. ^ Hammarström, Harald; Forkel, Robert; Haspelmath, Martin, eds. (2017). "Old Norse". Glottolog 3.0. Jena, Germany: Max Planck Institute for the Science of Human History. ^ Torp & Vikør 1993. ^ van der Auwera & König 1994, "Faroese" (Barnes & Weyhe), p. 217. ^ Moberg et al. 2007. ^ Bandle 2005, Ch. XVII §202 "The typological development of the Nordic languages I: Phonology" (H. Sandøy) : Old East Nordic, p.1856, 1859. ^ Bandle 2005, Ch. XVII §202 "The typological development of the Nordic languages I: Phonology" (H. Sandøy) : Old West Nordic, p.1859. ^ Haugen 1950, pp. 4–64. ^ Bandle 2005, Ch. XVII §202 "The typological development of the Nordic languages I: Phonology" (H. Sandøy) : Common Nordic, p.1855. ^ Bandle 2005, Ch. XVII §202 "The typological development of the Nordic languages I: Phonology" (H. Sandøy) : Proto-Nordic, p.1853. ^ Old Norse for Beginners, Lesson 5. ^ Noreen, Adolf. Altnordische Grammatik I: Altisländische und altnorwegische Grammatik. pp. 200–202, 207 (§ 277, § 283). ^ Old Norse for Beginners, Neuter nouns. ^ Old Norse for Beginners, Feminine nouns. ^ Zoëga 1910, H: hungr. ^ Bandle 2005, Ch. XVII §202 "The typological development of the Nordic languages I: Phonology" (H. Sandøy) : Old East Nordic, pp. 1856, 1859. ^ Kroonen, Guus, "On the origins of the Elfdalian nasal vowels from the perspective of diachronic dialectology and Germanic etymology" (PDF), inss.ku.dk (Presentation), retrieved 27 January 2016, (Slide 26) §7.2 quote: "In many aspects, Elfdalian, takes up a middle position between East and West Nordic. However, it shares some innovations with West Nordic, but none with East Nordic. This invalidates the claim that Elfdalian split off from Old Swedish." ^ Noreen, Adolf. Altnordische Grammatik I: Altisländische und altnorwegische Grammatik. p. 211 (§ 288, note 1). ^ O'Donoghue & ?, pp. 190–201. ^ Lass 1993, pp. 187–188. ^ a b Helfenstein, James (1870). A Comparative Grammar of the Teutonic Languages: Being at the Same Time a Historical Grammar of the English Language. London: MacMillan and Co.
^ a b c d e Cleasby & Vigfússon 1874, p.1, "A"
^ Cleasby & Vigfússon 1874, p. 389 col.1, "LIM"; p. 437, col.1 "MUND"
^ Cleasby & Vigfússon 1874, p. 481 "R"
^ a b c Cleasby & Vigfússon 1874, p. 757 "Æ"
^ Cleasby & Vigfússon 1874, pp. 113–4 "E"
Haugen, Odd Einar, ed. (2008) , The Menota handbook: Guidelines for the electronic encoding of Medieval Nordic primary sources (Version 2.0 ed. ), Bergen: Medieval Nordic Text Archive, ISBN 978 82 8088 400 8 , "The Menota handbook 2.0"
For a list of words relating to Old Norse, see the Old Norse language category of words in Wiktionary, the free dictionary. Danish is a North Germanic language spoken by around six million people, principally in Denmark and in the region of Southern Schleswig in northern Germany, where it has minority language status. Also, minor Danish-speaking communities are found in Norway, Sweden, Spain, the United States, Canada, Brazil, and Argentina. Due to immigration and language shift in urban areas, around 15–20% of the population of Greenland speak Danish as their first language. Proto-Norse was an Indo-European language spoken in Scandinavia that is thought to have evolved as a northern dialect of Proto-Germanic in the first centuries CE. It is the earliest stage of a characteristically North Germanic language, and the language attested in the oldest Scandinavian Elder Futhark inscriptions, spoken from around the 2nd to the 8th centuries CE. It evolved into the dialects of Old Norse at the beginning of the Viking Age around 800 CE, which later themselves evolved into the modern North Germanic languages. The Danish language developed during the Middle Ages out of the Old East Norse, the common predecessor of Danish and Swedish. It was a late form of common Old Norse. The Danish philologist Johannes Brøndum-Nielsen divided the history of Danish into "Old Danish" from 800 AD to 1525 and "Modern Danish" from 1525 and onwards. He subdivided Old Danish into "Runic Danish" (800–1100), Early Middle Danish (1100–1350) and Late Middle Danish (1350–1525). The history of the Icelandic language began in the 9th century when the settlement of Iceland, mostly by Norwegians, brought a dialect of Old Norse to the island. Icelandic is a North Germanic language spoken in Iceland. Along with Faroese, Norn, and Western Norwegian it formerly constituted West Nordic; while Danish, Eastern Norwegian and Swedish constituted East Nordic. Modern Norwegian Bokmål is influenced by both groups, leading the Nordic languages to be divided into mainland Scandinavian languages and Insular Nordic. Historically, it was the westernmost of the Indo-European languages until the Portuguese settlement in the Azores.